A funny thing has happened over the last several years. Genres have emerged and merged. First might have been romance and mystery but now there all sorts mixed up together. Urban fantasy is a recent genre and now, as I have discovered, urban fantasy mystery. 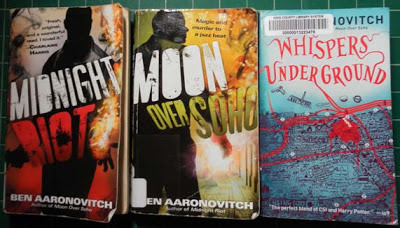 I picked up Whispers Underground by Ben Aaronovitch at the library, started reading and was so impressed I stopped to get the first two in the series. Unheard of! I am in love. Peter Grant, probationary DC with the London Police about to be assigned to the paper work division, discovers he has a gift and there's more than Horatio or anyone's dreamt of going on in modern London. Magic is real and it's being used to violate the Queen's Peace. Smart, funny writing. Laugh out loud funny. Read it to your family and friends funny. Here, read an excerpt from the first page of Midnight Riot. "Being a seasoned Londoner, Martin gave the body the "London once-over"--a quick glance to determine whether it was a drunk, a crazy or a human being in distress. The fact that it was entirely possible for someone to be all three simultaneously is why good-Samartitanism in London is considered in extreme sport like BASE jumping or crocodile wrestling. Martin, noting the good quality coat and shoes, had just pegged the body as a drunk when he noticed that it was in fact missing its head. As Martin noted, to the detectives conducting his interview, it was a good thing he'd been inebriated, because otherwise he would have wasted time screaming and running about--especially once he realized he was standing in a pool of blood. Instead, with the slow methodical patience of the drunk and terrified, Martin Turner dialed 999 and asked for the police." And it gets better. Magic, Latin, London history and geography, literary references, jazz. Oh, and really gory crime by really creepy characters.